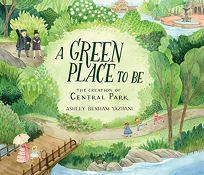 Yazdani’s debut picture book depicts the birth, bustle, and beauty of New York City’s iconic Central Park. Vibrant watercolor illustrations full of period detail tell the park’s story, beginning with a design contest in 1858. Essential to the tale are architect Calvert Vaux and park superintendent (and famed landscape architect) Frederick Law Olmsted, who win the design competition with their idea for “a green gift to everyone.” The story’s initial pages show African-American families having to leave their homes to make way for the park; the loss of their community, known as Seneca Village, is one of several additional facts briefly mentioned in the back matter. The Lake, the Ramble, and the Children’s District are shown humming with the activity of wealthy-looking 19th-century parkgoers enjoying the amenities, as smaller vignettes focus on a few of the park’s aesthetic touches; in one double spread, the park’s many and varied bridges surround their designer. Watercolor scenes include a wide range of people enjoying the nascent park, and a final spread of diverse modern-day parkgoers reinforces Olmsted and Vaux’s idea for this egalitarian enclave. An author’s note and bibliography conclude. Ages 7–10. (Mar.) Correction: A previous version of this review misstated the design contest's date.